With the end of the quarter right around the corner, I thought that I would tell you guys more about one of the newest and most interesting Northwestern initiatives. The first-ever Improve NU Challenge was hosted this quarter, allowing students from all Northwestern schools to pitch their ideas to make our campus better. Hosted by the Associated Student Government (ASG), the Improve NU Challenge allows for Northwestern students to come up with solutions to some of the most common problems affecting the community. This year, more than two dozen teams pitched their ideas to a panel of Northwestern faculty at The Garage, Northwestern’s entrepreneurship center. 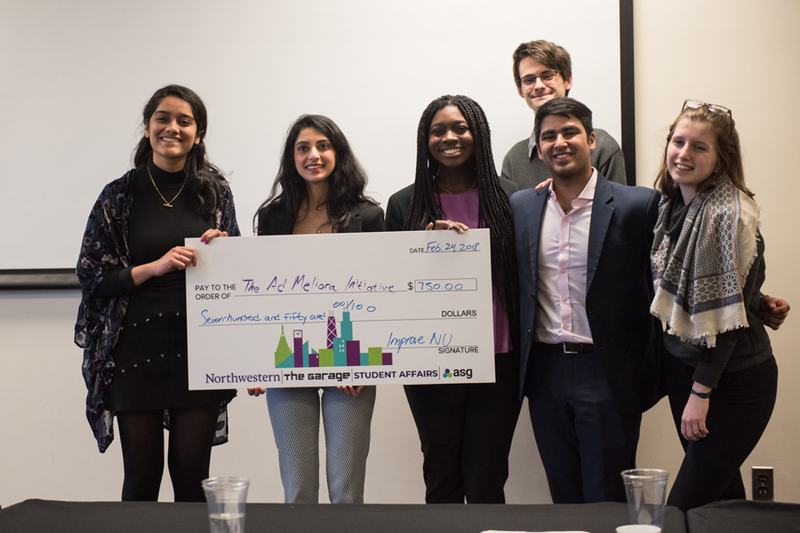 The top three teams were awarded prices of $750, $500 and $250 respectively in order to implement their ideas, plus the possibility to work with Northwestern’s Office of Student Affairs. This year’s winner was a project lead by Weinberg sophomore Neha Basti called The Ad Meliora Initiative. The project aims to implement resilience programming to improve student’s mental health. The team wants to start working on Ad Meliora this spring quarter by hosting their first trial session. During the first four weeks of the quarter, students would attend a 90-minute-long session focused on personal awareness, perfectionism and meaningful relations. The two other projects that were selected by the panel of Northwestern faculty were N.Struct and Wildcat Wellness. The first initiative aims to create a platform were Northwestern students can participate as teachers in areas that that they find interesting outside the regular curriculum. While Wildcat Wellness proposed a network of vending machines on campus for over-the-counter medication and essential hygiene products. The overall success of the NU challenge initiative, with dozens of teams involved and the support from ASG and Northwestern faculty shows just how committed Northwestern students are to improving our community. I was struck by the level of professionalism and insight that the teams had throughout the competition, reflecting their desire to make a contribution to our community. It is always great to see how Northwestern students are actively engaged in making our campus better, both on the institutional level as well as on ordinary daily activities. With such good projects taking the three top spots in this year’s competition, we can only imagine what students will come up with for next year’s challenge.